piLLai lOkAchAryar was leading our sampradhAyam to great heights in srIrangam after nampiLLai. At that time, he hears that ulUk khAn and his soldiers have arrived very close to srIrangam and are planning to attack the temple to rob off the great wealth. piLLai lOkAchAryar decides to carry namperumAL on a divine journey to avoid being there during the attack. He orders to build a wall in front of periya perumAL (mUlavar), arranges another uthsava vigraham in place of namperumAL and proceeds towards a safe place in south along with namperumAL, nAchiyArs and some srIvaishNavas. On the way, piLLai lOkAchAryar, being very old, unable to bear the toil of the stressful journey, decides to ascend to paramapadham at jyOthiskudi (near madhurai). It is at jyOthishkudi, piLLai lOkAchAryar accepts the young thirumalai AzhwAr (srIsailEsar - thiruvAimozhi piLLai) as his disciple and blesses him to be the next leader of our sampradhAyam. Subsequently, namperumAL travels to thirumAlirunchOlai, kOzhikkOde (calicut), thirunArAyaNapuram (mElkOte) and finally arrives to thirumalai and stays there for several years. Eventually, namperumAL returns to srIrangam, after a few kings gather strength and drive out the invaders and peace returns to srIrangam. Subsequently, maNavALa mAmunigaL arrives at srIrangam and re-establishes past glories of srIrangam. Fortunate were the ones who were in srIrangam at that time to have enjoyed the most wonderful times of srIvaishNava sampradhAyam under the able and compassionate guidance of mAmunigaL. With this background, let us see the divine journey of nammAzhwAr during this period in detail. While namperumAL was in kOzhikkOde, other near by dhivyadhEsa emperumAns and nammAzhwAr travelled to be with namperumAL for some time. 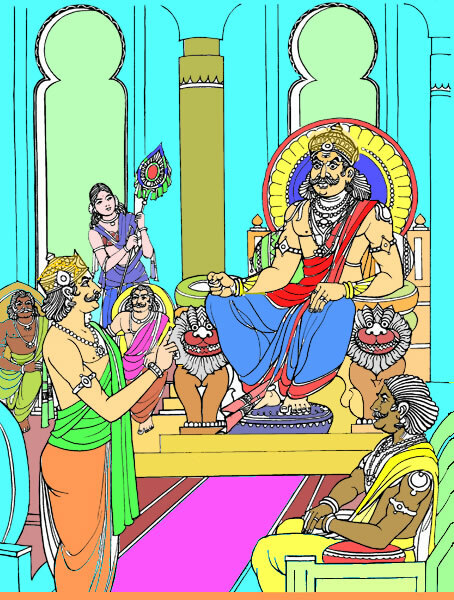 namperumAL being greatly pleased to see nammAzhwAr, asks the archakas to seat nammAzhwAr along with him and his nAchiyArs on his own Asanam (throne). namperumAL also offers his own pearl shirt and other paraphernelia to AzhwAr during this time and greatly enjoys the togetherness with AzhwAr. Subsequently, they leave from kOzhikkOde and go to thEnaikkidambai and stays there for some time. When namperumAL leaves from thEnaikkidambai, he asks nammAzhwAr to stay back (and eventually return to AzhwAr thirunagari). AzhwAr's kainkaryaparars then decides to carry him to further south western region (deep inside kEraLa) since all the other regions are considered unsafe at that time. After going a fair distance, they find a cliff and to protect AzhwAr, they place AzhwAr inside a box and safely bring him down in to the dangerous cliff. After that, robbers attack them and rob all the wealth from the kainkaryaparars. Among the kainkaryaparars, there was one named thOzhappar who was greatly attached to AzhwAr. While others escape the place fearing thieves and robbers, thOzhappar rushes to thirumalai AzhwAr (srIsailEsar - thiruvAimozhi piLLai) who is now in-charge of the kingdom (He becomes an important minister in the kingdom and after the king passes away, he takes care off the kingdom and trains the young prince in to the administrative aspects). 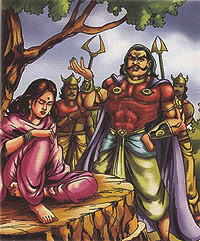 Hearing about AzhwAr's situation from thOzhappar, thirumalai AzhwAr sends a request to the king of kEraLa region asking for help and protection to safely bring AzhwAr out of the cliff. He also sends some of his close confidantes and wealth to rescue AzhwAr. The kEraLa king, welcomes the soldiers with great respect and at once sends his soldiers along with thOzhappar and others. They all reach the cliff with huge chains (to go down the cliff to rescue AzhwAr). When everyone was scared to go down the cliff, thOzhappar volunteers to do that task. 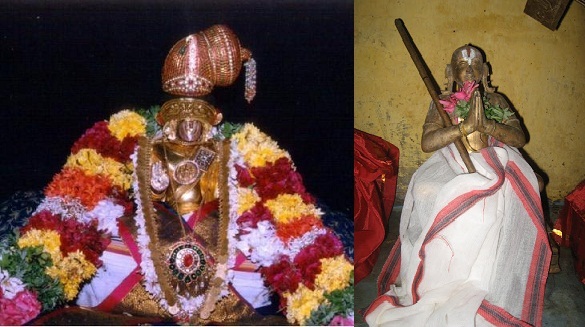 The kainkaryaparars of AzhwAr thirunagari who were there at that time, being pleased with thOzhappar's dedication, declares that "thOzhappar will be honored every day at par with vakuLAbharaNa bhattar and will get special honours during thirumanjanam as well with an aruLappAdu in the name of 'AzhwAr thOzhappar'". thOzhappar climbs down the cliff in a chained plank and locates the box in which AzhwAr was placed. With the palm leaf and pen he had, he writes down what he observes and places it on the top of the box safely. He first sends AzhwAr up on the plank safely and waits for the chain/plank to return. When the chain returns, he some how slips and falls down the cliff and ascends to paramapadham. thOzhappar's son becomes very sad seeing that, but the kainkaryaparars console him saying that "He is now the dear son of AzhwAr himself and he will receive all the honors that were offered to his father". After that they all reach a place named mundhirippu and perform samprOkshaNam for AzhwAr for 5 days there. The thieves/robbers who stole the wealth of AzhwAr and his kainkaryaparars hear this divine incident and they return all the wealth to AzhwAr. With that wealth, AzhwAr is carried over to thirukkaNAmbhi where he stays for some time. The archakas, kainkaryaparars, etc., perform thiruvArAdhanam, thirumanjanam and all uthsavams with great pomp and festivity to AzhwAr. A garuda pakshi builds a nest on top of AzhwAr's mandapam and stays there for protection and is considered as very auspicious by all. All the festivals were celebrated in a grand manner and many people from nearby places regularly visit and get the blessings of AzhwAr there. The pOthis and nambUtharis of various dhivyadhEsams (like thiruvananthapuram, thiruvaNparisAram, thiruvAttAru, etc) visit AzhwAr and become so attached to AzhwAr that they dont leave AzhwAr even for a moment. thirumalai AzhwAr, in the mean time, becomes greatly situated in our sampradhAyam by the desire/blessings of piLLai lOkAchAryar and by the efforts of kUra kulOthama dhAsar. kUra kulOthama dhAsar teaches thirumalai AzhwAr all the important principles of our sampradhAyam. thirumalai AzhwAr becomes very detached from his administrative commitments and he gives up all his responsibilities and just serve kUra kulOthama dhAsar. thirumalai AzhwAr learns about AzhwAr's stay in thirukkaNAmbhi and has great desire to go and serve him there. He at once reaches thirukkaNAmbhi and stays there for some time serving him regularly. At that time, he starts thinking about bringing AzhwAr back to his avathAra sthalam (AzhwAr thirunagari). First he goes to AzhwAr thirunagari and observes the whole place has become un-habitable. When AzhwAr left, many followed and left the dhivyadhEsam as well. thirumalai AzhwAr, himself takes up the task of clearing the woods, re-establishing the temple and the surroundings and thus becomes called "kAdu vetti guru" (AchArya who cleared the forests). He then brings AzhwAr over to AzhwAr thirungari and places him close to thiruppuLi AzhwAr (the divine tamarind tree) in his sannidhi. AzhwAr being greatly pleased, gives his own name of "satakOpa dhAsar" to thirumalai AzhwAr. thirumalai AzhwAr happily accepts that honour and becomes to be identified by every one as the target of AzhwAr's mercy. Due to his great attachment to thiruvAimozhi, he also becomes to be called thiruAimozhi piLLai. He also establishes the bhavishyadhAchAryan (emperumAnAr) temple in the western side of AzhwAr thirunagari dhivyadhEsam and builds rAmAnuja chathur vEdhi mangalam (four streets with experts in vEdha/vEdhAntham). 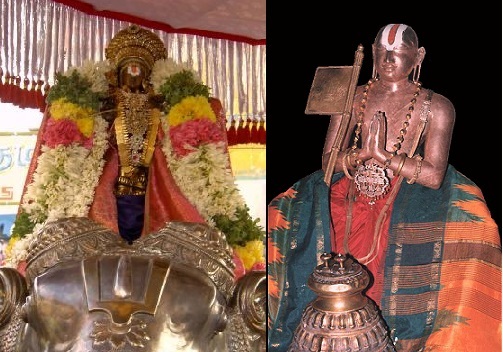 This bhavishyadhAchAryan vigraham of srI rAmAnuja in AzhwAr thirunagari is the one that came out when madhurakavi AzhwAr boiled thamirabharaNi river. He found a vigraham which was with anjali mudhrai (that is different from what madhurakavi AzhwAr was expecting - madhurakavi AzhwAr was expecting nammAzhwAr's vigraham with upadhEsa mudhrai) and when madhurakavi AzhwAr asked about this, nammAzhwAr declares that this the vigraham of the AchAryan who will appear in the future to re-establish sanAthana dharmam across the bhAratha dhEsam. This vigraham gets burried under the divine tamarind tree after AzhwAr leaves AzhwAr thirungari and was found under the divine tamarind tree by thiruvAimozhi piLLai during the re-construction. Thus, we have seen the divine journey of nammAzhwAr from AzhwAr thirungari to kOzhikkOde to thirukkaNAmbhi back to AzhwAr thirunagari. 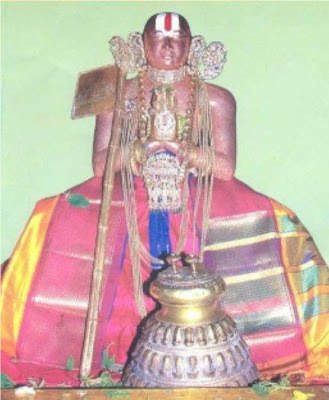 We have also enjoyed the great contribution of thiruvAimozhi piLLai to our emperumAnAr dharisanam in re-establishing AzhwAr thirunagari dhivya dhEsam, AzhwAr's proper daily worship, the construction of emperumAnAr (bhavishyadhAchAryan) sannidhi, the four streets around the same and establishing proper daily worship there as well. Sources: yathIndhra pravaNa prabhAvam - the whole narration explained here is based on the charithram (incident) as explained in piLLai lOkam jIyar's yathIndhra pravaNa prabhAvam (a work which dates back 500 years ago atleast) published by Dr V V Ramanujam swamy. 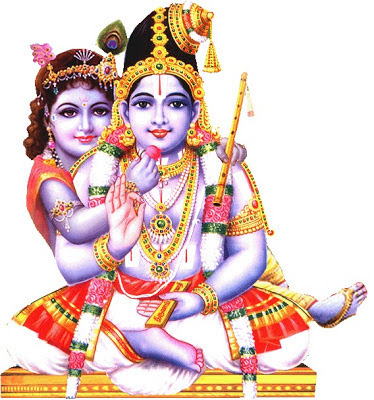 parAsara bhattar declares that nammAzhwAr (satagOpan) is krishNa thrushNA thathvam (srIrangarAja sthavam - 6) - which means AzhwAr is the embodiment of love (thirst) for kaNNan emperumAn (krishNan). In bhagavath gIthai 7.16 to 7.19, kannan emperumAn declares the glories of his devotees who are very attached to him. In 7.16, he first identifies four types of people who approach him - the one who is looking to revive lost wealth, the one who is inquisitive about AthmA and AthmAnubhavam, the one who is looking for new wealth and the one who is situated in pure knowledge about bhagavAn. In 7.17, he identifies that of these four, the one who is situated in pure knowledge is most dear to him and he is most dear to such gyAni as well. In 7.18, he says while all four are generous (because they are the ones who establish bhagavAn's supremacy by approaching him to fulfill their desires - without some one receiving he cannot manifest his magnanimity) - the gyAni is like his own AthmA. While the whole of vEdhAntham declares that bhagavAn is the antharyAmi (in-dwelling super soul) of all beings, here, bhagavAn himself declares that the gyAnis are his antharAthmA. The love and affection between bhagavAn and such gyAnis are unimaginable within our limited capacity. After many many births one becomes such gyAni and surrenders to me. Such great souls who fully accept me as the controller of everything that exists are very rare to find. He gives body and senses to the jIvAthmAs during srushti. He also reveals sAsthram through brahmA during srushti. But, without using the intelligence to reach bhagavAn, the jIvAthmAs simply spend their life in material pursuits. Seeing this, bhagavAn himself takes many incarnations like varAha, narasimha, srI rAma, krishNa, etc. But even at his physical presence, very few people accept him as supreme and surrender to him. Finally, just like a hunter catches a deer using another deer, bhagavAn wants to help jIvAthmAs through other jIvAthmAs. So, he picks a samsAri jIvAthmA, blesses him pure/blemishless knowledge and makes him satagOpa (nammAzhwAr). nammAzhwAr, by the divine grace and causeless mercy of bhagavAn, is born with great devotion towards srIman nArAyaNan. Just like thuLasi which reveals its fragrance during its sprouting stage itself and like iLaya perumAL (lakshmaNan) who was attached to srI rAma right from his birth, AzhwAr was greatly attached to bhagavAn right from his birth. This is why, when he was taken to AthinAthan emperumAn sannidhi (in AzhwAr thirunagari) as a toddler, he crawled into the divine tamarind tree, settled there and started meditating on bhagavAn. Coming back to krishNa's words in gIthai, nammAzhwAr proves to be such great gyAni with utmost attachment to bhagavAn. This we can understand by his various pAsurams and his own life (http://guruparamparai.wordpress.com/2012/08/18/nammazhwar/). Yet, his pAsuram for vaithamAnidhi emperumAn (thirukkOLur dhivyadhEsam) is one place where he explicitly reveals his attachment to kaNNan emperumAn (directly reflecting bhagavAn's own words of vAsudhEvas sarvam). Let us see this a little bit now. AzhwAr in the bhAvam (mood) of his own mother (i.e., parAngusa nAyaki's mother) explains that her daughter (nammAzhwAr) who considers krishNan as food (thAraka - one that sustains), water (pOshaka - one that nourishes) and betel leaves (bhOgya - one that brings joy) and is always crying out for bhagavAn, has left to meet vaithamAnithi emperumAn who has descended into thirukkOLUr in archA form for the upliftment of jIvAthmAs. So, for AzhwAr, bhagavAn is thAraka, pOshaka and bhOgyam - everything. In this pAsuram, AzhwAr's great attachment for krishNan is revealed by himself. This quality of full dependence on bhagavAn and looking out for bhagavAn alone is the true nature of a gyAni identified by bhagavAn himself in bhagavath gIthai. Specifically, the glories of dhivyadhEsa emperumAns and bhagavAn's utmost mercy of descending to dhivyadhEsams for our benefit is explained. Also, it is explained that we should always engage in some kainkaryam in dhivyadhEsams is also emphasised in this pAsuram. Because krishNAvathAram is the most recent avathAram of bhagavAn. So, everyone remembers and discusses about the most recent activities often. Everyone is concerned about the well-being of krishNan since he was born in dark night inside the jail and was constantly chased by the evil-minded kamsa and others. krishNan's childhood pastimes are so amazing. He fully exhibited saulabhyam by getting bound by the cow-herd girls and leaving himself at the full control of cow-herd boys and girls of vrndhAvan. This quality is greatly appreciated by AzhwArs in their pAsurams. nammAzhwAr sung many pAsurams enjoying the glories of krishNAvathAram and was unable to bear the separation from bhagavAn even for a moment, which is why he was called krishNa thrushNA thathavam (embodiment of love for emperumAn). In AchArya hrudhayam chUrNikai 57, azhagiya maNavALa perumAL nAyanAr identifies that bhagavAn himself spoke his glories through nammAzhwAr and still brought all the fame and glories to nammAzhwAr. 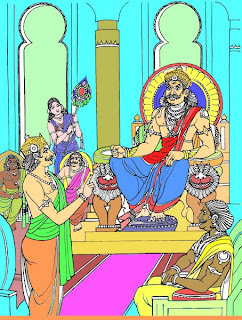 He establishes this through AzhwAr's own pAsurams, specifically thiruvAimozhi 7.9 padhigam where AzhwAr explains how emperumAn is in full control of nammAzhwAr and his words. In this chUrNikai, nAyanAr says that "nAdum kaiyedukkumpadi" (நாடும் கையெடுக்கும்படி) - mAmunigaL beautifully explains that, as soon as we hear the name "satagOpan", everyone performs an anjali (saluting with folded hands at chest height) towards AzhwAr's direction. This is why we see people performing anjali in aruLicheyal gOshti when the last pAsuram of every padhigam in thiruvAimozhi is sung, since AzhwAr's name is present in the last pAsuram of every padhigam. Even while we hear bhagavAn's name, there is no such practice of performing an anjali immediately - but emperumAn gave such honors to AzhwAr that any time any one hears AzhwAr's name they perform an anjali immediately towards AzwAr's (AzhwAr thirunagari - his avathAra sthalam) direction. Thus we have enjoyed a little bit about the deep and loving relationship between nammAzhwAr and krishNan (which is to be found nowhere else). Let us pray at the lotus feet of nammAzhwAr to be blessed with pure knowledge and service to bhagavAn/bhAgavathas. It was a great fortune to visit vAnamAmalai and AzhwAr thirunagari dhivya dhEsams during during 2013 chithrai thiruvAdhirai thirunakshathra mahOthsavam of emperumAnAr. Here is a quick view of emperumAnAr uthsavam and various other wonderful events. On this day, varthamAna (current) jIyar swamy accepts all honors from various divyadhEsams on behalf of previous swamy. Every year, on 4 occassions, varthamAna jIyar swamy wears the kaNaiyAzhi (ring) that was worn by maNavALa mAmunigaL himself and passed on through various jIyar swamys of vAnamAmalai mutt. thirunakshathram (appearance) day of varthamAna swamy, thirunakshathram and thIrtham days of previous swamy and final day of chAthur mAsyam. Please observe the mAmunigaL's ring in varthamAna swamy's hands. bhavishyadhAchAryan sannidhi is located in the west side of AzhwAr thirunagari surrounded by four streets named rAmAnuja chathur vIdhi mangalam. AzhwAr thirunagari at one time became covered with forests. thiruvAimozhi piLLai cleared the woods, re-established proper temple worship at AdhinAthar - AzhwAr temple. After that, he built a separate temple for srI rAmAnujar in the west side of the town and built four streets around the temple. Following his orders, maNavALa mAmunigaL took good care of this temple and he himself performed thiruvArAdhanam to emperumAnAr here. It is at this time, mAmunigaL composed yathirAja vimsathi (20 slOkams in glorification of emperumAnAr) and offered that to bhavishyadhAchAryan in this temple. All in all, a very divine experience. When we go to these wonderful dhivya dhEsams, there is a serene and calm feeling. It is amazing to see the total dedication of many srIvaishNavas in these dhivya dhEsams where there is clear lack of financial incentives to stay and serve. It is purely the binding of the few surviving srIvaishNavas towards emperumAn, AzhwArs and AchAryas that ensures that every thing happens smoothly. For example, in AzhwAr thirunagari, there are more than 30 separate sannidhis (for emperumAn, AzhwArs, AchAryas) and there are only about 10 or so active srIvaishNavas who run from one sannidhi to another to ensure that there is at least one thiruvArAdhanam and some bhOgam every day. In spite of steady power cuts, lack of proper resources, etc., uthsavams happen with great dedication and joy. We can do a little bit by atleast visiting these dhivya dhEsams regularly and supporting the kainkaryaparars as much as possible.